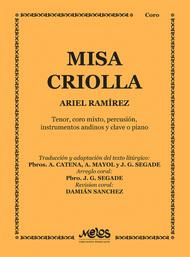 Misa Criolla composed by Ariel Ramirez (1921-). Edited by Segade. For tenor voice solo, mixed choir & orchestra. Published by Melos Ediciones Musicales (QM.MEL-5206). 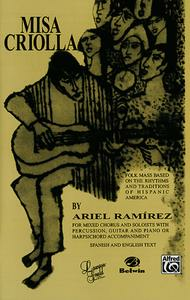 Misa Criolla composed by Ariel Ramirez (1921-). Choir Sacred. For SATB choir, piano (or harpsichord), guitar, string bass and percussion (3 players) (SATB choir). Choral (Sacred); Choral Worship Cantata; Larger Works; Worship Resources. Lawson-Gould. Folk Mass based on the rhythms and traditions of Hispanic America. Choral, Sacred and Spanish. Octavo. 64 pages. Published by Alfred Music (AP.LG51362).A folk mass for mixed chorus and soloists with percussion, guitar and piano or harpsichord accompaniment. Approximate duration 16 minutes. Percussion includes (3 players): 2 Tenor Drums; 2 Tom-Toms; Triangle; Jingles (cascabeles); Small Gong; Temple Blocks; Snare Drum with Brushes. Instrumental accompaniment available on rental.About Lawson-GouldAlfred offers sophisticated and challenging choral publications in the respected and well-established Lawson-Gould catalog. This series includes arrangements and original choral works by many distinguished composers, such as Robert Shaw, Alice Parker, James Erb, Dave Brubeck, and Robert DeCormier. Select publications will continue to be added to this catalog, as well as new voicings of time-honored favorites.